When I said I liked Mexican food, I wasn’t joking. No really, I could eat it all day, every day. 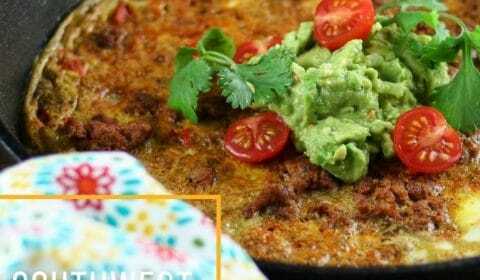 This Southwest Frittata hit the Mexican taste buds on the spot! To be honest, I’m not a big breakfast fan. I normally just like to drink my ‘fatty’ coffee (aka Bullet Proof Coffee) and then wait and eat at lunch time. 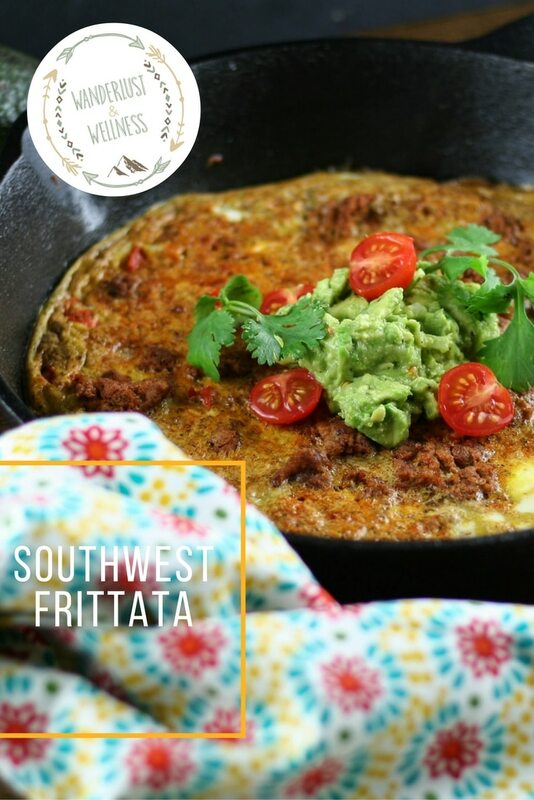 But a few weekends ago I decided I wanted to mix up a frittata and what better way than to make it a Southwest Frittata! Frittatas are so easy to make, like ridiculously easy. And I especially love when I can cook in my cast iron skillet. 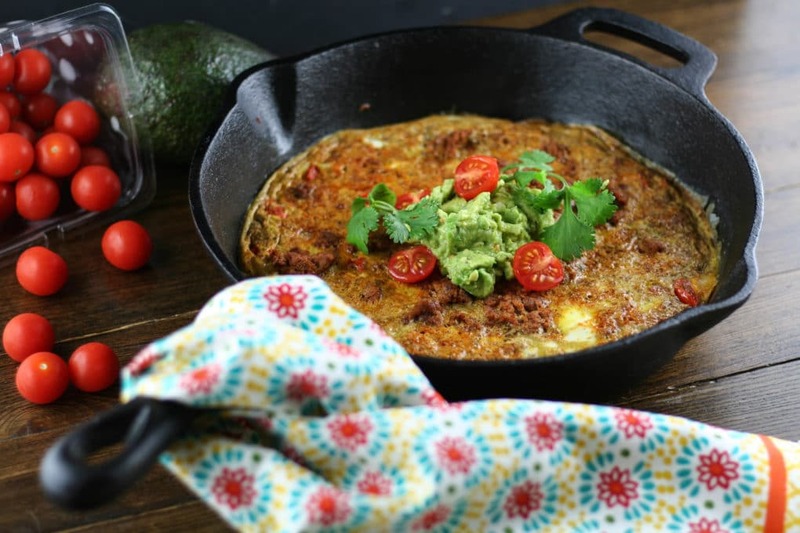 In my opinion, the chorizo and guacamole set this frittata apart from its fellow frittatas. I cooked this in a 9 inch cast iron skillet, which kept the frittata pretty thin. You could try a smaller skillet but this worked well for me. I cut the frittata up into pie-like slices and then created a frittata sandwich with guacamole in the middle. De-Lic-Ious! In a small bowl, combine the eggs and seasoning and whisk together. 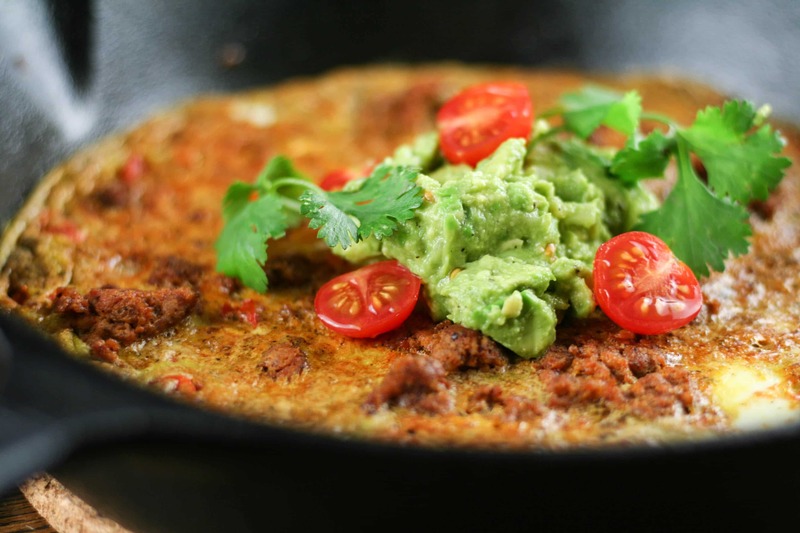 In a separate skillet, cook the chorizo and drain off any extra grease. Place the cast iron skillet on medium high heat and add the ghee and onions. After onions begin to brown, add in cherry tomatoes. Cook for about 1 minute or until tomatoes have softened. Pour egg mixture into the skillet and shuffle skillet until the egg is evenly distributed across the pan. Place the skillet in the oven, under the broiler, and cook for approximately 3-4 minutes until the frittata is set. Always watch closely when cooking under the broiler. Top with guacamole, hot sauce, cilantro, or whatever topping you prefer.